The National Philharmonic of Ukraine started its concerts seasons in 1863, when the Kiev Branch of the Imperial Russian Musical Society (ERMS) was founded. At the beginning of the XIX century, the development of the musical art in Kiev assumes a great importance. Famous European musicians, as Franz Liszt and Weniawsky brothers, come with recitals to the famous Kiev Contract Fairs. Thus, the creation of the musical society turned out to be quite timely. Among its initiators and founders were such well known at that time public figures and musicians as R. Pfening, M. Lysenko, P. Seletsky, M. Bogdanov. The Hall of Columns of the Philharmonic can boast of a rich and wonderful history. The best guest performers of a world level considered it an honour to appear on this stage. The world music stars gave their concerts here: I.Arkhipova, L.Bernstain, E.Gilels, O.Glazunov, K.Zanderling, V.Clibern, L.Kogan, K.Kondrashin, F.Liszt, S.Lemeshev, K.Mazur, G.Neigauz, D.Oistrakh, Yu. Ormandi, S.Rachmaninov, S.Richter, P.Robson, G.Rozhdestvenskii, M.Rostropovich, A.Rubinshtein, T.Ruffo, l.Sobinov, O.Skriabin, V.Ferrero, A.Khachaturyan C.Zecchi, F.Shaliapin. Beside them, names of outstanding figures of Ukraine shine brightly: Z.Gayday, R.Glier, K.Dankevych, M.Lysenko, S.Lyudkevych, B.Lyatoshynsky, G.Mayboroda, I.Patorzhynsky, N.Rakhlin, M.Rylsky, K.Semionov, S.Turchak, I.Shamo, A.Shtogarenko. Incomparable Lysenko String Quartet and the world-famous Kiev Chamber Orchestra were born here. Performing in this concert hall were the Veryovka Ukrainian Folk Choir, the Bandura Players Chorus of Ukraine. 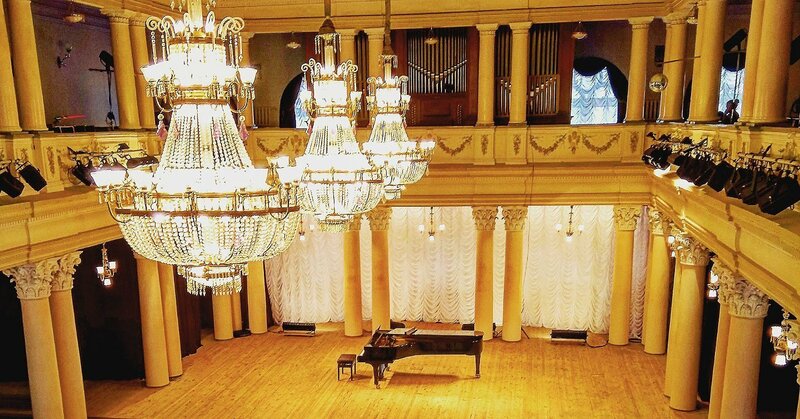 In this hall the Lysenko String Quartet and the Kiev Chamber Orchestra gave their first concerts after they were created. The main place where you can hear all the classical instruments. It's your almost-every-day relax after 7 PM. Polite stuff, clean and nice building. classical music concerts are held on the permanent basis. Usually you can buy a ticket here for just 5-10 euro. A gem of the city. Beautiful renovation, now even very convenient online-ticket-sales:-)! A good venue... I've seen many concerts here and never been disappointed. One thing: Consistently the nastiest people in Kiev work there. The women in the bufet yell and scream at patrons. The coat check guards are, uniformly, surly. Where did they get these people from, Minsk circa 1976? 208 m. 1А Grushevskogo str.